Alan Moore Feels V For Vindicated | Birth.Movies.Death. The comic book curmudgeon approves of the V FOR VENDETTA mask becoming a symbol of global protest. The nice thing about symbols is that they don't have to be tied to any one meaning. They can change as the context around them changes. It's this fluidity that allows symbols to last and last. Take for instance the symbol of the Guy Fawkes mask. It is now the face of a global protest movement, but before that it was the icon of Anonymous, which grew out of 4Chan, who got it from V For Vendetta. And not the comic V For Vendetta, but from the largely ignored movie adaptation starring Natalie Portman. Of course before it became the symbol of V For Vendetta's mysterious hero it was used in a strange English holiday, and before that it was the face of the man who tried to blow up Parliament in the Gunpowder Plot. Alan Moore was notoriously unhappy with the movie version of V For Vendetta. He thought it took his Thatcher era parable and neutered it by leaving out the words 'fascism' and 'anarchy' (I think he's a bit cranky; good stories can keep their impact and meaning when transposed into new scenarios and over new ideas. 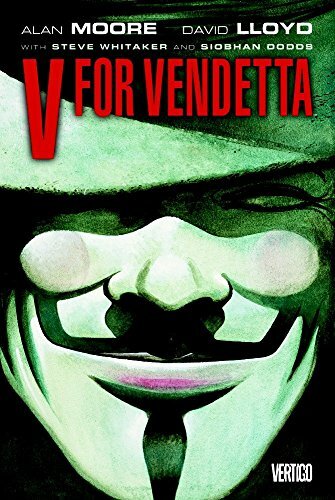 V For Vendetta is successful in making a 20 year old comic story very relevant for the post-9/11 era). But he's very happy with the way that the global protest movement has reappropriated the mask in a way that really honors his original intention. When the film was made during the peak period of anti-terrorist legislation the golden touch of Hollywood was, it seemed, sufficiently persuasive for the authorities to permit a massed horde of extras dressed as the nation's most famous terrorist to cavort riotously in Parliament Square. I don't think one need subscribe to any quasi-mystical theories about how the conceptual world of ideas can affect the substantial world of everyday existence in order to agree that, in retrospect, this could be seen as practically begging for it. Our present financial ethos no longer even resembles conventional capitalism, which at least implies a brutal Darwinian free-for-all, however one-sided and unfair. Instead, we have a situation where the banks seem to be an untouchable monarchy beyond the reach of governmental restraint, much like the profligate court of Charles I. Then, a depraved neglect of the poor and the "squeezed middle" led inexorably to an unanticipated reaction in the horrific form of Oliver Cromwell and the English Civil War which, as it happens, was bloodily concluded in Northamptonshire. Read the entire editorial here. Thanks to @HankKingsley0 for the link!